Years ago I featured a room with a pulldown vintage map installed to hide a flat screen TV. I was smitten and vowed I too would one day try that brilliant idea in my own home. So far, I haven’t had the opportunity since we don’t have a TV hanging on the wall. MUST remedy that. But the other day I found someone who did try it and WOW, does it look amazing! 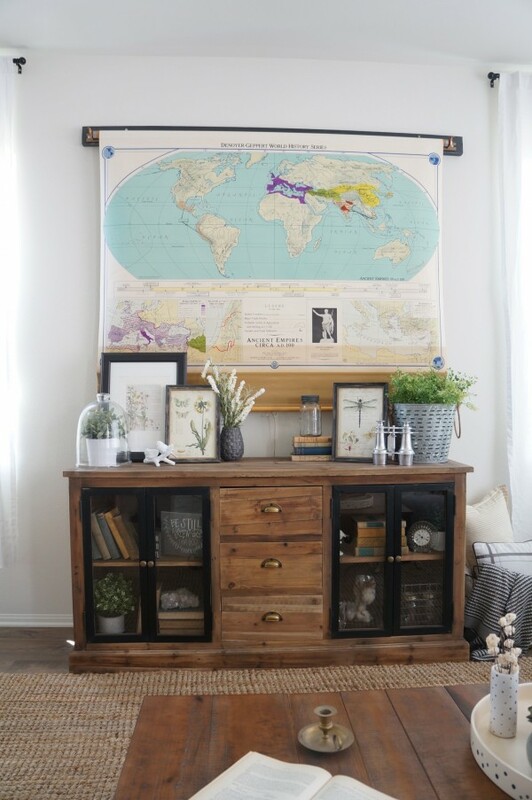 Karen shared her room and this TV/map project over at Home Love Stories. Go see more photos of her lovely room and get the details on the pull down map. 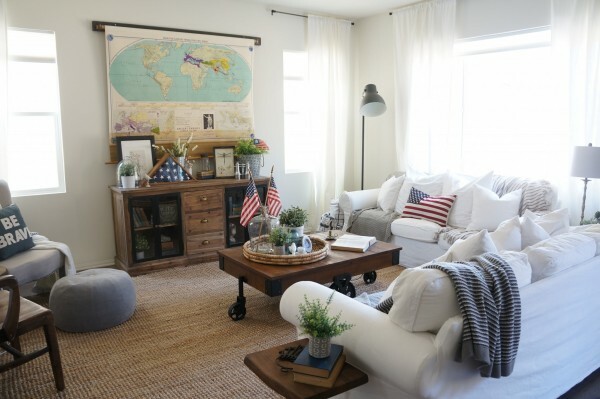 And check out her blog at Perfecting the Homefront! 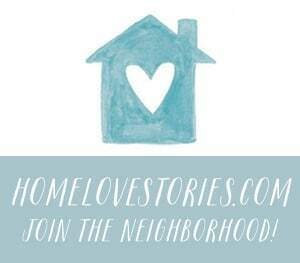 I love seeing your projects and homes, so I hope you’ll share yours and join in the community at Home Love Stories! Come back later today for a fun weekend giveaway! Wow, that looks great! You’d never know there was a TV underneath. Love this idea since the TV isn’t my favorite thing to look at when not in use. Maybe taking it a step further would be using a projector for TV purposes with a 2nd pull-down layer for wall art? Although I’ve never actually purchased one, my dream TV would be a projector like you describe. I borrowed one for a movie night and realized it’s probably the most design-friendly option. One of my favorite smart space saving applications of this concept is by Brian Levy of the Minum house. I don’t like the picture on a pull-down, projector screen. I’d rather watch tv on something smaller, like a computer or tablet, than watch it on a projector screen or blank wall. That is such a great idea! One I’ll definitely use if I ever have a TV hanging on the wall. In the meantime, I’ll share this post with friends who do. dang that’s genius! we also, don’t a wall installed TV . . . also we have a man picked ‘jumbo-tron’ which may need the real world, not just its map, to be covered. We will have a large flat screen TV over our fireplace in our new home..not in love with a big, black square above a beautiful mantle. Mone solution I was thinking of was to get one of those TVs that become a mirror when it is turned off…THEN I see your post….Absolutely brilliant!! Our home will be minutes from the ocean and will be decorating I. A coastal way..a large map would be great to cover the TV! Thanks for the Inspiration/idea!!! I recently saw a blog post with suggestions for decorating around a flat screen TV. To me, most of the ideas seemed to draw more attention to the TV. Now this is idea is the perfect solution for those of us who don’t want a flat screen to dominate the room. Loved the days when we could hide the TV in an armoire. lol The roll-down map is the next best thing. Keeping that one in the back of my mind for our upcoming move! How cool is that! I really love the whole room too. Great ideas. Love this site!